Long after any sane deadline for MTN 41—with half the pages already slapped down, in fact—Michelangelo Antonioni’s The Passenger, formerly Profession: Reporter, formerly either The Final Exit or The Fatal Exit, I can’t remember which, was sneak-previewed in Seattle. Within a few days—just before this magazine comes out—it will have opened at the Music Box Theatre for what may well be a short run—short because people who grooved on Jack Nicholson in Chinatown and The Last Detail and maybe even Easy Rider may be frustrated by Nicholson’s low-key incarnation of a character with so little edge that he keeps sliding right out of the frame. It merits longer, more seasoned consideration; but for the moment, something ought to be said about it. That, for instance, it’s a film pitched on the highest and lowest levels of viewer sophistication, which is also to say that it almost seems to have been made for those people who go to films in groups of two or more in order to talk a movie all the way to the end title: “Who’s that? Why is he going in that door? There’s that other guy—is he one of them?…” Or—put it another way—this card-carrying artsy-fartsy atmospherist Antonioni has rediscovered the ultimate in cinematic abstraction in the style and stuff of the old-time serial matinee, wherein it was sufficient, when the narrative needed a little zap, simply to pan over to a vaguely sinister figure in the corner reading a newspaper, or have someone in the right kind of fedora stroll through the shot after the hero had vacated it on his long, twelve-chapter pursuit of truth and justice. Here, a black face appears amid a street crowd; a woman in white is noticed about to materialize from behind a fern when a woman in white is just what we’re looking for and just what we expect to see coming from the opposite direction; a girl who’s trying to reunite with a man in a blue shirt somewhere on a series of erratically canted and joined rooftops peers down toward a noisy quarrel on a patio below which happens to include a man in a blue shirt…. In the deliberately unspecific political context of the film, a black face may be abstractly sinister or just inadvertently there. Moreover, such a face may be there and not-there: Shortly after our main character has rendezvoused with a black activist and then gone on along his doglegged itinerary (someone else’s itinerary that he has made his own but we’ll get to that…), we see the activist jumped on and beaten by other blacks, then cut to an off-color image of a black man led to his execution—the next logical stage after a beating and possible kidnapping, except that this is another black man (they all look alike…) and his execution, though “next” in the sequence of the film’s image-facts, was actually a previous event; for we are somewhere else now, watching a newsreel sequence on a movieola. You’re confused? OK, some story, then: David Locke, documentary filmmaker trying to run down a civil war somewhere in an African desert, returns to his hotel after a surely typical day of non-, even anti-event, to find that a fellow named Robertson in the next room has peacefully succumbed to a heart attack in his sleep. Funny thing: Robertson looks a lot like Locke … and an idea creeps into Locke’s head while the camera drifts around the room as though borne on heat waves. Switch the passport photos, trade wardrobes; look into the face of the same perfunctorily polite black guy on the desk you were talking to moments ago and say, “The gentlemen in the next room—he seems to be dead.” New life, no fuss. A man who has stayed off-camera while filming a world in chaos opts for being in another movie. But this movie has a scenario he hasn’t read; moreover, as he follows its trajectory, his old life reaches out for him, and people from different movies start turning up on the same screen. As literary memories crowd into the mind—an appointment in Samarra, “Death and the Compass,” Sam Spade’s anecdote about a man named Flitcraft—Locke/Robertson comes to the end of a road which, in the film’s final shot, is revealed after all to have been another intersection. I wouldn’t describe that last shot, and its phenomenal six- or seven-minute predecessor, for all the world because that’s what they constitute: all the world. But I can’t resist giving away one detail that Antonioni, probably deliberately, doesn’t let us perceive clearly at first even though its presence nags at us. Rather, I can’t resist giving away what the detail (a sign on a car) gives away: that we are in Andalusia. And in the last two shots of The Passenger there is an Andalusian dog. It’s not a flip film joke: The Passenger is an honorable addition to a tradition that includes not only Un Chien andalou but also (and here I must rely on secondhand testimony) those earliest fantastical adventures filmed by Feuillade: movies in which film space, living space, the outer spaces of the world and the inner spaces of the soul and the imagination converge to lend a new clarity to our lives, and to perception itself. I can’t say that I liked The Passenger at first—I think I’m coming to that—but I’m impressed, to say the very least. I know more about movies than I did a couple days ago. Maybe, since The Passenger, there’s more about movies to know. Direction: Michelangelo Antonioni. Screenplay: Mark Peploe, Peter Wollen, Michelangelo Antonioni, after a story by Peploe. Cinematography: Luciano Tovoli. Art direction: Piero Poletto. Editing: Franco Arcali, Michelangelo Antonioni. Production: Carlo Ponti. 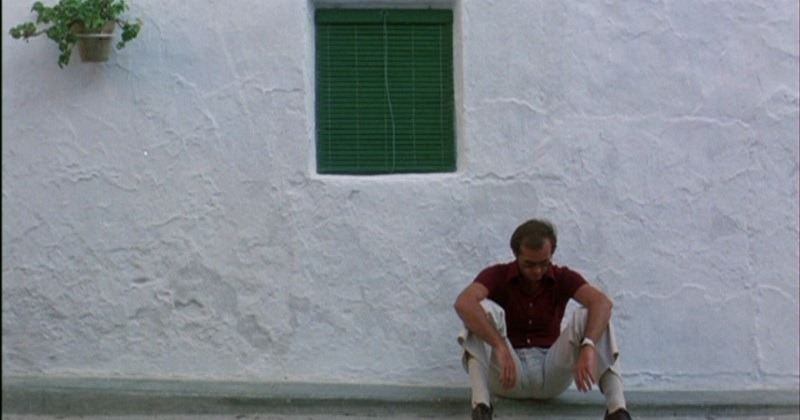 The Players: Jack Nicholson, Maria Schneider, Jenny Runacre, Ian Hendry.